It can be super confusing to know what the best option is to refinance or consolidate your student loan debt. There are so many different lenders and banks - along with just as many programs - that it can be overwhelming. Student Loan Refinancing - Getting a new private student loan to replace your existing loan and/or loans. Student Loan Consolidation - Combining multiple Federal loans into one loan. With all the student loan refinancing companies we're going to discuss, you can refinance and/or consolidate. You can also do some of your loans or all your loans. It can be confusing to figure out what you should do, but in general, you shouldn't refinance Federal student loans unless you can afford paying your loans on the standard 10 year plan. But, if you can afford, refinancing can make a lot of sense financially. If you already know that refinancing makes sense, and you're looking for the best place to compare options in 2 minutes with no credit check, we recommend Credible. As a bonus, College Investor readers get a up to a $1,000 bonus! Citizens Bank is one of the few banks on this list. We like them because they offer a lot of great loan options, backed by the stability of a bank. Fixed and variable rate loans options. Furthermore, Citizens Bank has a release program where a co-signer may be removed from loan responsibility after making 36 consecutive, on-time principal and interest payments. Lastly, there is a $10,000 minimum loan amount so this might not work for a borrower with a low loan balance. Read our full Citizens Bank review. Get up to a $1,000 bonus when you refinance at Citizens through Credible. CommonBond is one of the first student loan refinancing companies. They are a no-fee lender that offers both fixed and variable rate loans. CommonBond also offers a unique unemployment protection program where loan payments are paused and it helps eligible graduates find new jobs - ever hiring them for short-term consulting projects. CommonBond also takes a unique giving approaching to its lending - funding Pencils of Promise with every loan it refinances. Read our full CommonBond review. Earnest is on this list because it's one of the most flexible student loan refinancing companies - they offer the ability to pick any monthly payment and term between 5 to 20 years – saving you more than standard rates and terms. They also give you the ability to change your loan – you can refinance your loan for free, change payment dates, even skip a payment once a year and make it up later. Earnest has no set income requirements for borrowers. They are also fee-free, and offer unemployment protection to pause your monthly payments if you lose your job. Read our full Earnest review. Whether you’re trying to refinance existing student loans at low interest rates, or you're a parent looking to refinance a Parent PLUS Loan into your child's name, ElFi (or Education Loan Finance) is one of the best lenders out there. The ElFi loan minimum is $15,000 for refinancers, with the maximum being your outstanding loan balance. This can be a huge win for borrowers with high student loan debt, especially doctors. ElFi doesn’t have specific credit minimums posted, but they do require borrowers to be creditworthy (or have a creditworthy cosigner). As a bonus, ElFi is on the Credible platform, so you can not only see how they compare to other lenders, but also get up to a $1,000 bonus! Read our full ElFi review. Get up to a $1,000 bonus when you refinance with ElFi through Credible. 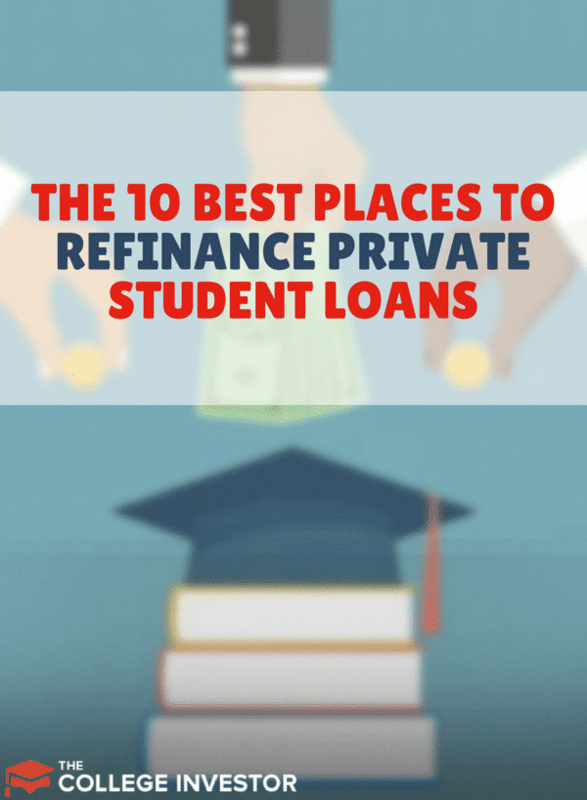 First Republic Bank makes this list of the best places to refinance your student loans because they offer one of the lowest fixed rate student loan options on the market. They do have stricter requirements - higher loan amounts, higher income requirements, and you need good credit. But, if you do qualify, they can save you a ton of money! Plus, you do need to be located in a location that First Republic Bank services. But the tradeoff is that you can get one of the lowest interest rate fixed-rate loans available. Read our full First Republic Student Loans review. Get up to a $200 bonus when you refinance at First Republic. Laurel Road, formally DRB Student Loans, is an established student loan lender with a new name. Laurel Road is best suited for medical and dental graduates, however they have loan options for any borrower. What we like about them is that they are one of the few lenders that will refinance more than $300,000 in student loans. They will break it up into a second loan, but they at least will offer the service. If you consider Laurel Road, apply through our site for a $200 bonus! Read our full Laurel Road review. Get up to a $200 bonus when you refinance through Laurel Road. LendKey is a student loan refinancing lender that pools money from community banks and credit unions to offer well-priced student loans to borrowers. LendKey offers loans between $5,000 and $300,000, depending on the degree earned by the loan holder. For example, the lowest amount is for undergraduate degrees, which caps at $125,000. LendKey bases its rates upon your credit and discounts are given for auto-pay. They also have no origination or prepayment fees. One thing to note, LendKey does not allow refinancing for borrowers who didn't graduate. Read our full LendKey review. PenFed is one of the newest additions to this list of the best places to refinance student loans. The reason? The have some of the lowest student loan refinance rates we've seen, and they keep getting lower and lower. PenFed is also on the Credible platform, so you can easily see how PenFed compares to the other top lenders out there. PenFed offers loans up to $150,000, but you typically have to show strong earnings or have a cosigner that meets their requirements. PenFed is also the only lender we've seen that does allow for spousal student loan refinancing - which is a unique option some may want to consider. Read our full PenFed review. Get up to a $1,000 bonus when you refinance through PenFed at Credible. SoFi is another of the original student loan refinancing lenders - and probably the most well known. They offer a wide variety of fixed rate and variable rate loans, with 5, 7, 10, 15, 20 year repayment terms. SoFi even offers mortgages. SoFi loans have no origination fees or prepayment penalties. SoFi also offers unemployment protection for borrowers, and even has a career support program. To get the best rates, you have to have excellent credit or you'll have to have a cosigner for your loan. SoFi does have a cosigner release program. Read our full SoFi review. Get up to a $200 bonus when you refinance through SoFi. Splash Financial is a relative newcomer on this list, but they are doing great things with medical school student loan refinancing. Splash Financial offers student loans with no original fees, and unique repayment plans. For example, they are offering $1 per month repayment options for doctors going through training. However, they only offer loans between $25,001 and $346,000. That high minimum could be a challenge for some borrowers who would benefit from refinancing. But the high maximum is helpful for doctors. The great thing about Splash Financial is that they offer one of the best bonuses currently available! Splash is currently offering College Investor readers a $500 bonus if you refinance at least $50,000. Read our full Splash Financial review. Get a $500 bonus when you refinance through Splash. The requirements to refinance student loans are a bit different than when you took out your loans. For Federal loans, you simply had to fill out the FAFSA. With some graduate school loans (such as medical school loans), you might have had to have a credit check beyond the FAFSA. However, with private student loan refinancing, the requirements are more like getting a car loan or mortgage. If you don't meet all of these requirements, you might need to get a cosigner for your loan. Read this full guide on how to get a student loan with no cosigner. Credible does offer loans with no cosigner for qualifying candidates. When you're looking at the best banks and places to refinance student loans, there are quite a few considerations. Every bank or student loan lender has it's unique perk or angle, and you have to take that into consideration when weighing your options. While there is no "right" or "wrong" loan type when it comes to your individual situation, we believe that most borrowers would benefit from a student loan refinance loan that is only 5-7 years. Borrowers should look for loans that have no origination fees, and if a cosigner is required, there should be an easy cosigner release process. However, every person has different needs and a different situation. Think about your loan needs accordingly. Student loan refinancing isn't for everyone. However, if you're able to afford your loans on the standard 10-year repayment plan, and don't plan to take advantage of any student loan forgiveness program, then you should strongly consider student loan refinancing. These are the top student loan refinancing companies, and you'll strongly benefit from comparing your options amongst these lenders. Also, make sure that you're always paying attention to our list of the best student loan refinancing bonus offers. To make it easy, we recommend using Credible. Try Credible and compare your options in 2 minutes with no credit check. ​As a bonus, College Investor readers get a $200 bonus if they complete a refinance! If you love one of these companies - let us know and help other readers out! Question on the Credible $200 offer. Do you have to use the Credible Widget at the top of the page for it to count? Or if I clicked on the “Try Credible Here” link that’s bolded, does that count? Do I need to sign up for a account with the college investor for this offer to be valid? No, any link or the widget counts. But you have to sign up through out page (whatever way you choose) to get the bonus. I have student loan debt AND credit card debt that I would like to consolidate. Do any of these companies do that, or are they strictly student loan refinancers? Thanks for your help! No, these companies don’t consolidate both together. In fact, you don’t want to either. Student loan interest is tax deductible (even after you refinance). But, if you were to get a loan to consolidate in your credit card debt, then the total loan would no longer qualify. How does the 1000$ work? I went to Credible and am in the process. Is it only for referrals? You get up to $1,000 if you refinance $100,000 or more. $200 for everyone else. You must have gone through this website, as we’re one of the only places you can find this deal. You’ll receive it when the loan closes. My spousal consolidated student loan is in default, and has been bought by ___. My ex-wife and I had as a part of our divorce agreement that we would be responsible for our own debts (we consolidated our loans in Louisiana and divorced in New Mexico. I currently live and work overseas. I have been unwilling to consider loan rehabilitation due to the fact that I did not want to pay for her student loan debt (all of which was incurred well before we married). I had read from multiple sources that there was no remedy for this type of situation until congress changes the law allowing dissolution of the consolidation (which still has not happened despite the face that the practice of spousal consolidation is no longer allowed by law). What would be the exact process I should follow to allow me to rehabilitate “my” portion of the loans? I would like to add that I am a teacher and had worked in low income schools my entire time teaching in the US, that would have allowed me to “write off” a portion of my loans. Is there a way that I can get this ability back “before” I refinance? There is no way for you to keep a Federal loan and split your spousal consolidation loan. As a result, you’re not going to be eligible for PSLF with this loan (the program that allows student loan forgiveness). You also cannot do anything to just your portion of the loan, except disability discharge if you qualify for it. Everything else must be done jointly. Now, if you both have good credit and qualify, some credit unions might allow you to split the loan into each of your names. It’s rare, I’ve never seen it actually done, only heard this as possible. Remember, if you do refinance, you now have a private loan that you’re obligated too. To follow up: You mention disability discharge. While I am not qualified for this, my ex-wife is legally disabled. This being the case, if we were to jointly agree to rehabilitate the loan, would she then be allowed to have her portion of the loans discharged? If so, exactly how would this work? Would the government then recognize each of our separate loans allowing her to discharge her portion? Another reason why I have been unwilling to consider rehabilitating the defaulted loan is due to the ridiculous amount of the current balance. I borrowed less than $35,000, my ex less than $45,000. When I last checked, due to the interest and penalties, the loan balance was in excess of $300,000. If rehabilitated, would there be a willingness to forgive some of the interest and penalties in order to make it feasible for us to consider the rehabilitation? If so, who would make this decision, the company that bought the debt or the government? As it stands, she has absolutely no incentive to pay her portion of the loan because the only money it costs her is a small tax refund each year (as she is “disabled”, and making little money), since I am the one on the hook for the bill. I have little current incentive because the balance might as well be a billion dollars, as I would have about the same chance of paying back that amount as I am to pay back $300,000+. It would apply apply to her portion of the loan – but both of your names would still be on the loan. The remaining balance would just be your portion – principal, accrued interest, and fees. No, there will be no forgiveness of your interest and penalties. In fact, once you rehabilitate, those capitalize into your loan. If you continue to ignore it, it will just grow, and the government will continue to take your payments – Social Security, tax refunds, etc.